Wamogo coach Gregg Hunt had his team running on all cylinders in a blowout win at Northwestern Friday night. TORRINGTON — With just one more regular-season stop before the Berkshire League Tournament begins next weekend, Wamogo roared out its readiness with a 95-50 wipeout over the Highlanders at Northwestern High School Friday night. The Warriors (19-0; 17-0 Berkshire League), who clinched the program’s first Berkshire League title in more than four decades last week, continued their dominance by ending Classical Magnet’s unbeaten season, 77-63, last Saturday. “We’re still getting better,” said Wamogo coach Gregg Hunt. Who at Northwestern High School (8-11; 7-10 Berkshire League) could doubt him in Friday night’s BL game vs. the Highlanders? “They shot the lights out,” said Northwestern coach Doug Sebach, who said he wished his team played more aggressively in the first half. But, really, when Wamogo wasn’t running fast breaks off steals or making pinpoint passes for layups in a half-court set, the Warriors swung it around the arc for an open man outside, with or without Northwestern’s defensive aggression. That’s where the lights went out. Wamogo shot 11-for-18 in the first half on three-pointers; 14-for-28 for the game. With no real comparison intended, those are numbers Steph Curry of the Golden State Warriors would be proud of. 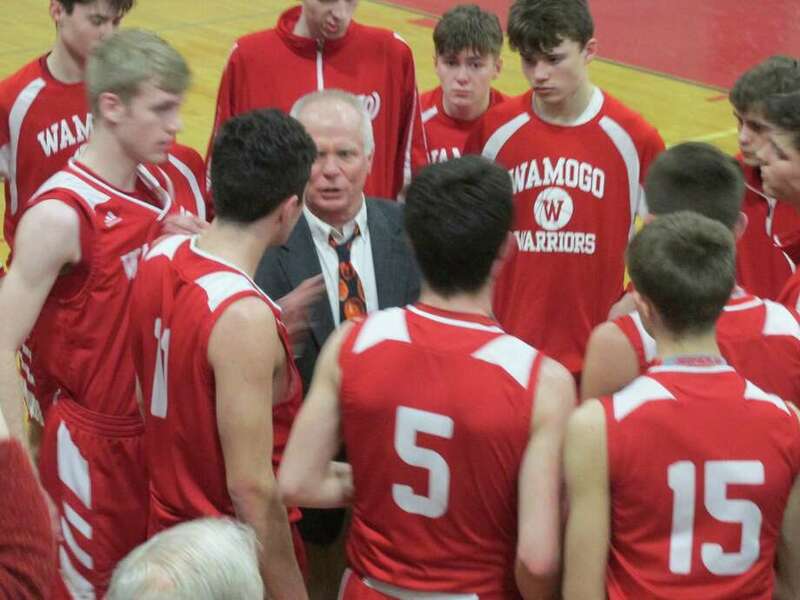 Wamogo’s Warriors started with just three 3-pointers in a 22-4 first quarter, then stepped up the artillery in the second with eight more for a 52-23 halftime spread. “Everybody on the team can shoot threes,” said Hunt. Friday, that included team leader Garrett Sattazahn with five threes in a game-high 25 points, along with 7 assists, 7 rebounds and 6 steals. Reid Turtoro, just 10 points away from 1,000 points, had four threes for all 12 of his points. Sean Coffey had two and Cole Higgins, Ben Roy and Ethan Collins joined them with one apiece beyond the arc. With lots of his work on the run, Collins’ 17 points came on 80 percent shooting. “We’re peaking at the right time,” said Hunt. Northwestern junior forward Joe Ogonoski battled under the basket for a team-high 14 points. With Wamogo’s starters sitting for most of the fourth quarter, junior guard Matt Mozzarelli kept the pace going with eight of his 14 points for the night. No matter who plays, nobody’s likely to wear out the Warriors for a while. Six sets of brothers spread out over Wamogo’s varsity, JV and freshman teams. All of them are undefeated. Wamogo (95): Sean Coffey 3-1-9; Reid Turtoro 4-0-12; Cole Higgins 1-0-3; Ethan Collins 8-0-17; Ben Roy 1-0-3; Matt Mazzarelli 6-2-14; Garrett Sattazahn 10-0-25; Eric Odenwaelder 1-0-2; Jasper Brodhead 3-0-6; Jack King 1-0-2; Coffey 1-0-2; Totals: 39-3-95. Northwestern (50): Levi Delaney 3-0-7; Cameron Mulligan 1-0-2; Matt Maltby 1-0-2; Owen Maltby 2-0-6; Colin Wilson 2-0-5; Curtiss Blische 2-2-7; Brandon North 2-1-5; Joe Ogonoski 6-2-14; Clay Maloney 1-0-2; Totals: 20-5-50. 3-point goals: W — S. Coffey 2; Turtoro 4; Higgins; Collins; Roy; Sattazahn 5. NW — Delaney; O. Maltby 2; Wilson; Blische. Records: Wamogo 19-0; 17-0 Berkshire League. Northwestern 8-11; 7-10 Berkshire League.